Another card from a kit for my stash! These were featured in my March class. This fun fold is best done with double sided paper so I used this gift wrap which I bought overseas years ago. It is trimmed to 4" x 5.25" and slit on the center about 1.75" from the right hand side and when the flaps are fold out it reveals the embossing on the card front. 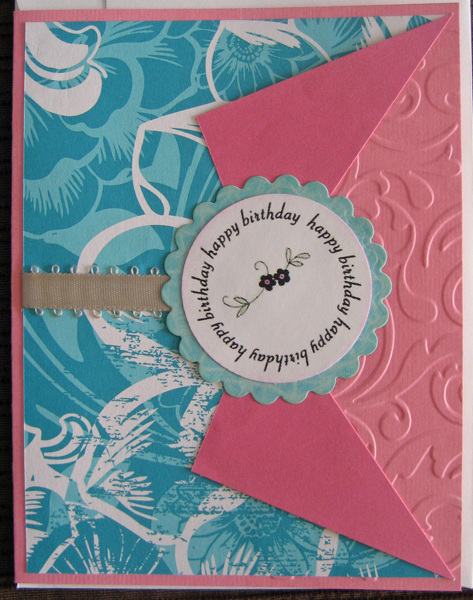 I used two small pieces of double sided tape right next to the fold to secure the flaps, added a length of ribbon from the bottom of the slit to the left hand side of the background securing the ends with double sided tape before adhering it to my embossed card front. I created a layered greeting which features a laser printed digital greeting from Desert Diva and a scalloped circle cut with Nestibilities both sponged a bit on the edges and mounted using 3D foam tape. This is my last kit so I will see about making these different next time around! !